These terms have been in use for hundreds of years. They were developed by traders as a shorthand way of expressing the parties’ rights and obligations with respect to the shipping or transportation of goods being bought and sold. They were originally developed when the primary means of freight transportation was by water on the rivers and oceans of the world, long before trains, trucks and planes were in existence. Thus FOB: freight on board (a ship), or FAS: freight along side (a ship). With the development of rail, motor, and air transportation, the terms are now also used for these modes for both domestic and international transactions. Although there was a general consensus among traders on the meaning of the terms, a need arose to exactly and formally define the trade terms in common usage due to the explosive expansion of trade and shipping that began with the Industrial Revolution in the 19th Century. Accordingly, in the first half of the 20th Century, three organizations set about to create such definitions. The first organization to tackle this task was the International Chamber of Commerce (ICC). The ICC first published what they called Incoterms in 1936. These were reviewed and revised in 1953, 1967, 1976, 1980, 1990, 2000 and, most recently, 2010. Most people recognize the terms of sale used for domestic transactions within the United States. Unlike the terms of sale used in international transactions, however, the domestic terms of sale are not defined in a single source or by an authoritative body. Rather, they have arisen over time through their use by business people and the transportation industry. FOB Destination, Freight Collect and Allowed. These terms establish the contractual rights and responsibilities between a buyer and seller for delivery, risk of loss, title, and payment of freight charges. The definition of these terms, as well as a few others, derive from a combination of (1) the provisions of the Uniform Commercial Code, Article 2 (the UCC), (2) the National Motor Freight Classification (NMFC), and (3) industry usage. These terms are commonly incorporated into companies’ operating systems, quotes, contracts and commercial invoices for domestic transactions. This is clearly appropriate since the terms are supported by decades of use, case law, and statutory law. When it comes to international trade, however, companies using best practices will switch to Incoterms 2010 in quotations, purchase orders, contracts, commercial invoices, and other commercial documentation when dividing the responsibilities for risk transfer, costs and responsibility for carrier selection between the buyer and the seller. Who is RESPONSIBLE for forwarder & carrier selection? Before you can calculate a sales price and negotiate a sales contract, you must determine what responsibilities and expenses are assigned to the seller and the buyer. This includes transporting and insuring merchandise from the time it leaves your plant or warehouse to the time it arrives at your purchaser's premises. There is a generally accepted, readily understandable nomenclature called Incoterms 2010 that relates the trade term to the various transportation options. The trade terms do not identify where the transfer of title or ownership will occur. A separate statement regarding transfer of title should be made in the body of the contract, the quote, proforma invoice, and commercial invoice. Incoterms 2010 provide a common reference to establish the point at which risk of loss due to loss or damage transfers from the buyer to the seller and the attendant transportation costs for which each party has responsibility. Knowledge of Incoterms 2010 is essential for exporters and importers to prepare contracts with terms appropriate for their customers and to make sure those contractual terms are properly fulfilled. As soon as a seller places the phrase “EXW Plant, Houston, TX USA - Incoterms 2010” on their quote, proforma and commercial invoice, both parties know that the inland or air or ocean freight are collect and freight forwarding fees and customs clearance at destination are for the account of the buyer. It is international shorthand defined by the ICC. These relative responsibilities divide the costs of arranging transportation, and in some cases insurance, between the parties. It also divides the risk of loss between them. Incoterms 2010 are not shipping terms, instead they are part of the sales contract and help the seller and buyer define the roles and the costs that each will have in the transaction. Does your buyer have facilities in the United States to take possession of the goods and arrange transportation? Does your company regularly receive inland freight rate discounts for truck or rail transportation to the port of loading? 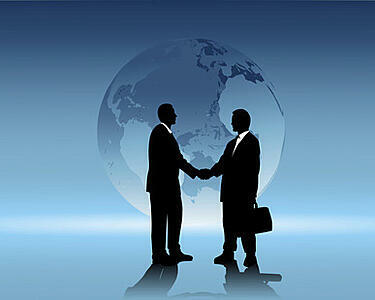 Is your buyer new to international trade without knowledge of how to arrange transportation? It often depends on the volume of shipments that the buyer or seller controls in a year that will determine who is able to obtain a cost advantage when negotiating with air or ocean carriers or consolidators. There may not be any cost advantage for one or the other, but by utilizing a quote prepared with costs itemized by Incoterms 2010, the seller and the buyer are able to make that determination. The Incoterms 2010 Chart of Responsibility provides a thumbnail sketch of the terms; it is critical to the complete understanding of Incoterms to refer back to the ICC’s publications. Incoterms 2010 and the UCC: A Guide to International and Domestic Terms of Sale by Catherine J. Petersen and Brent WM. Primus (and the source from which this article was adapted). This post was originally published in October 2006 and has been updated to include current information, links and formatting.